Drinking alcohol in Islamic countries in the Middle East is considered unlawful. UK firm Beverage Company got the idea to conquer the UAE market by launching the world’s most expensive booze-free tipple named Ruwa. It is meant for those who do not wish to drink booze yet have a taste of the fine life. Price per bottle is whopping 20 million Dirham ($5.5 million). 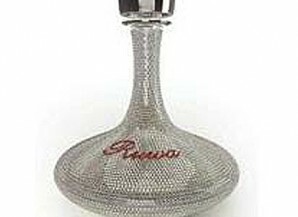 Hand-carved crystal decanter containing Ruwa is encrusted with 8.000 diamonds, 200 rubies and two bars of white gold. John Edgar, Beverage Company boss, says he is optimistic it will be a hit in the Middle East. He said: This is the first luxury halal drink on the market. It is being marketed at high-end individuals, hotels and establishments. If you have a problem to find a $5.5 million, there is also a low-budget version at just 3 million Dirham ($817,000). It tastes of elderflower. And rose. It’s very different and has quite a strong taste, said Edgar. And of course, if you buy a bottle, we will provide refills.